I really ought to do this more often. Get up at 5 in the morning, I mean! It is so quiet and cool. The birds are twittering and chatting outside, and I feel really relaxed and happy here, enjoying a cuppa, and spending a little time with you. The last 2 days have been full on. Yesterday evening we waved goodbye to the first group of Clarity friends who joined us for a art-packed 2 days. What can I say? If the next sessions are anywhere near as enjoyable and fun, I am in for a fantastic week. So you think all we do is make cards, huh? 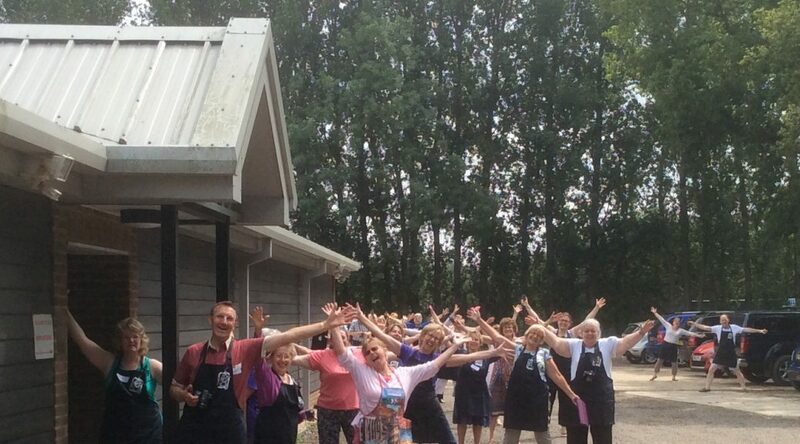 And so, whilst I was really sad to say “till next time” to these lovely lovely people, time stands still for no-one. This morning, we welcome a new group of Clarity guests. I am excited to welcome them too! the kettle will soon be boiling, and we will take it from the top. So I must go get ready, and take Dave a brew. or you can get the lot at a great price! How do you get the stencil image to stay so crisp? 1) Attach the stencil to the card with masking tape on top of a sheet of copy paper. 2) Mix a little ink in with the shaving foam on a plate. 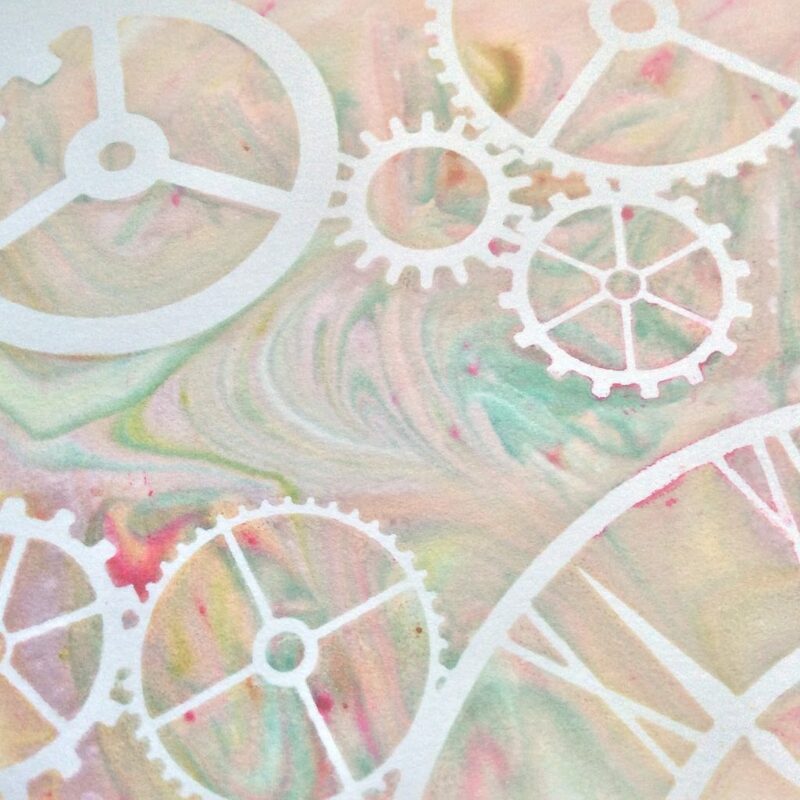 Make swirls and patterns with the end of a paintbrush or a fork. 3) Scoop some of the mix up with a ruler and put it on the copy paper above the stencil. Maybe a little below, too. 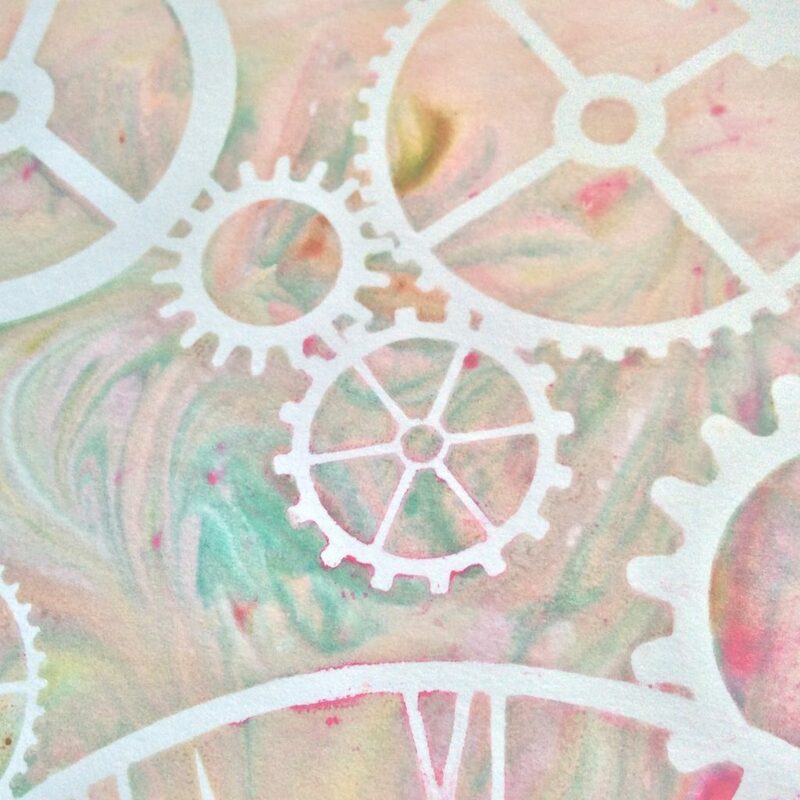 4) Using the ruler or a spreader, slowly drag the coloured shaving foam through the stencil. You can change direction to get twists in the colours, you can come in from different angles. 5) Scrape off the excess. 6) Lay a sheet of paper towel over the stencil, and blot away the excess shaving foam. 7) Carefully remove the stencil. 9) In the meantime, make the next one…. and that, my friends, is how the stencil stays nice and crisp. Time. Is it me? Or is time speeding up? Can you believe that July is nearly spent again?? The days just seem to fly by. Literally. I have finally worked out that, since time is moving so fast, I have to spend it wisely. I try not to waste it, like I used to when I was younger. I still catch myself sometimes, doing stupid, senseless stuff, wasting precious time. If it was gold, I would be more careful with it. I suppose I should treat it as if it were. and see if my attitude shifts. Want to join me? I am sure we will ! Day 4 – Jayne’s Birthday! Fab picture, those lucky ladies. I'm looking forward to Catterick in September, not that I'm wishing time away, as you said time is precious indeed. Must crack on with my day, dogs to walk then Month-end accounts to finish! Hi Barbara. Great shaving foam piece, I find it rather addictive and when I get it out I make loads to use a backgrounds ( I use an old baking tin and lay the paper on top of the foam as I always spoil it if I try and move the patterned foam!) 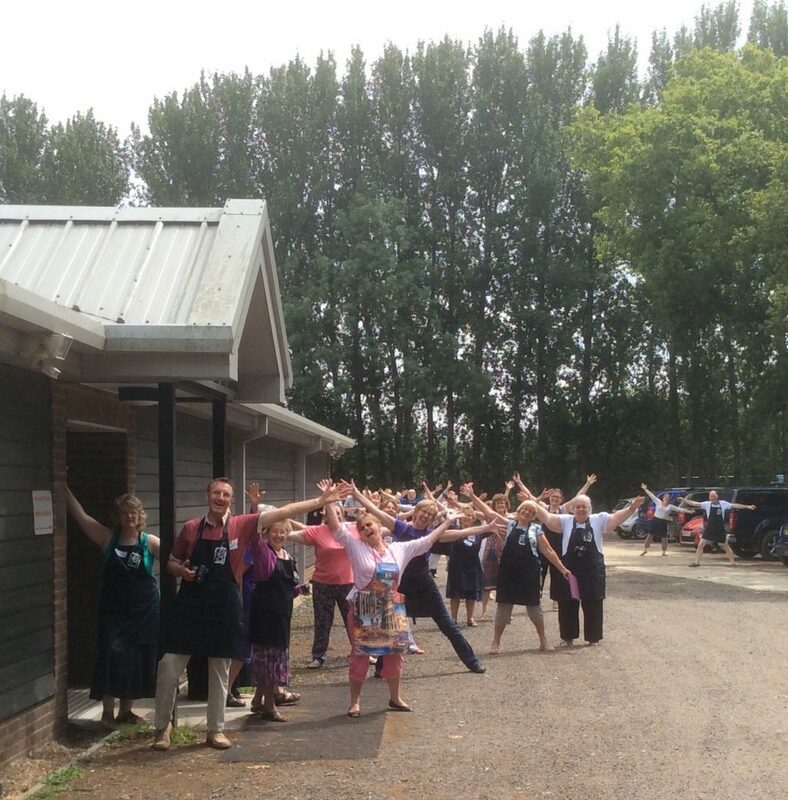 Good to hear that you all had a great retreat, enjoy this one just as much : ) Take care. I have bought the shaving foam. All I have to do now is try it! Hi Barbara. What a brilliant use of the stencils. Now it is the summer holiday I intend to do lots of playing with stamps and stencils. Hi Barbara. Glad it's all going so well and you've managed to enjoy the start of a new morning. Expect you'll have your hands full with this next retreat as you've got a lot of my Northern friends coming & we have such a great time at our classes with Maria (Hi Jo, Jane, Sam, Sharon & Susan). I'm can't wait for my turn in August! Loving the combination of shaving foam & that stencil. It's so sharp too. Will defo be getting some cheap foam to do this. I love the marbled backgrounds and this is a quicker way to get the marbled effect than the oil paints on water we use to do . Time does seem to fly by but for many it is slower because they are lonely – the best use of my time is sat with one of my elderly ex-neighbours , chatting about what ever topic we choose . She see's few people and says time drags and yet we can loose 2 or 3 hours sat chatting over coffee and home made cake . May be if we all shared our speeding clocks with someone' who's clock plods on may be we could readjust the balance ? I don't see my time as gold more the way I fill it lol! Looks fab Barb ,will be seei g you next week so save so e energy for me . Hi Barbara, love your shaving foam technique. Enjoy today. 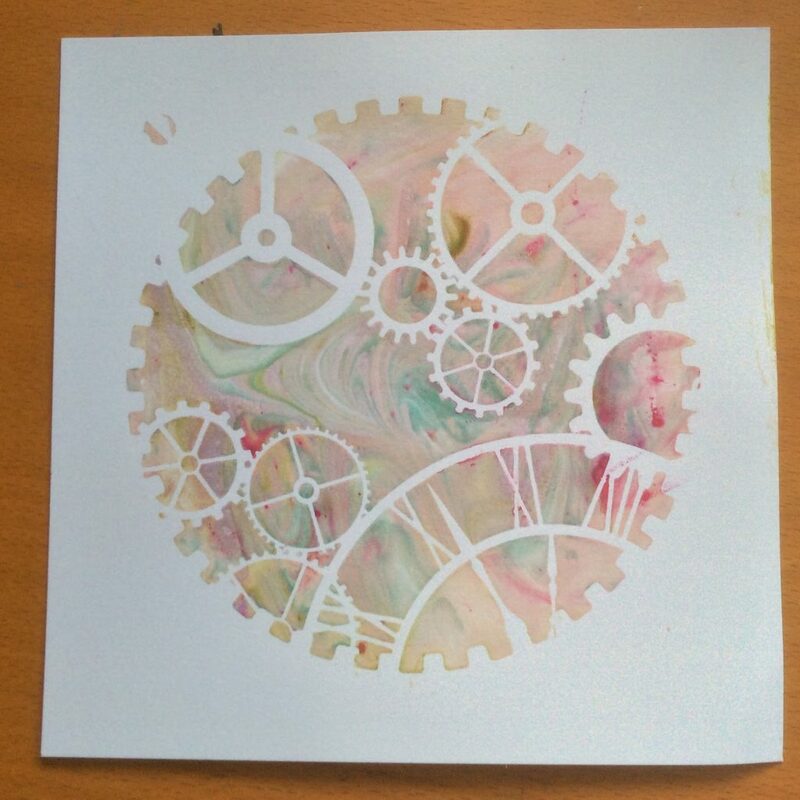 Love it, stencil is great and so is the shaving foam… the colours come out beautifully. Hello Barbara. I was thrilled to see a button on someone's blog which brought me in one click to your own blog. I read a few posts and wanted to sign up to be a follower …. but sadness of sadness' – it appears I can only click to follow if I either have a Google account (I don't), or a Twitter account (I don't) or a Facebook account (I don't). Thank you Barbara for this gentle reminder of the last technique from yesterday. I had a wonderful 2 days and would have happily stayed for more. The "team" were fab, so friendly and helpful. I'm so looking forward to the Fri/Sat workshops – only 2 sleeps to go now!! I'm sure that you've had a lot of fun with today's group, too. I'll get to join you one day! Yes, the passing of time is really scary. Even on a day where I have nothing important planned, I never get done all I'd like. People thought that, when I retired, I'd be bored and time would drag-how wrong they were!!! I do take the point from Crafty Magpie, though. I'm lucky to have such full days. I love the shaving foam, I have yet to play with it but I will very very soon. I think I will actually demo with it for September, in my monthly craft club. 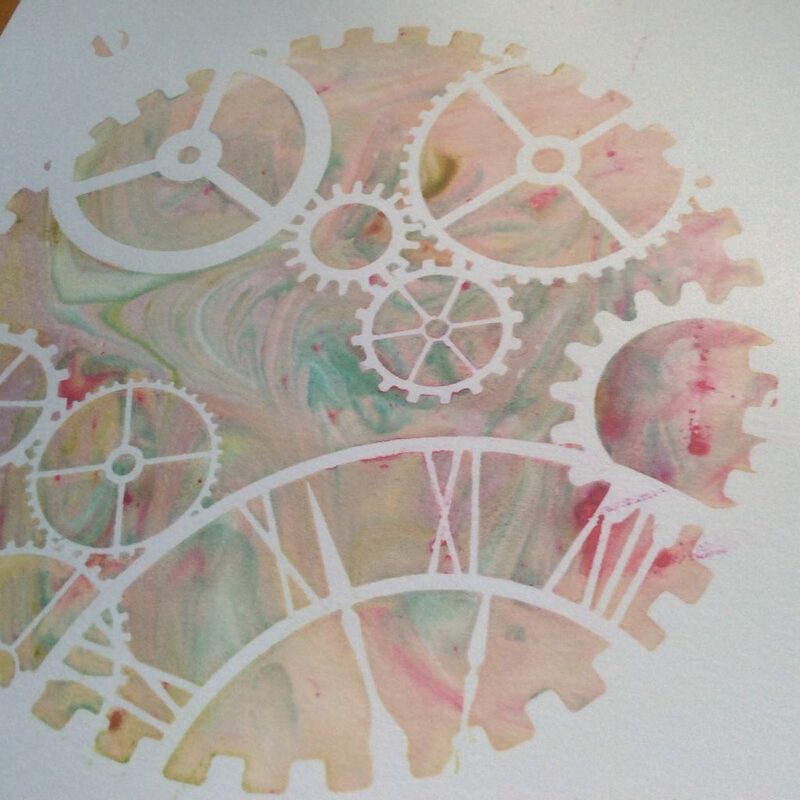 I was very brave this week and played with the shaving foam and inks but using the squared stencil, although I do have the mechanical one. I was dead chuffed because I placed the stencil on black card and it looks really good. Made my day. thank you Barb for encouraging me to give the technique a whirl.